^The existence of identifiable body decorations on some Neanderthal humans from as early as 75,000 B.C.E. provides intriguing evidence of the first human use of adornment or decoration, and thus the first incidence of fashion. In the Shanidar Cave in northern Iraq, remains of Neanderthal man, an early subspecies of Homo sapiens, were found alongside lumps of red iron oxide and rubbed manganese. Archeologists, scientists who study the physical remains of past cultures, believe that these items were used to draw designs on the body. The red material is thought to symbolize blood, but it is not known whether the decorations were meant to attract or frighten. Cro-Magnon (another prehistoric ancestor of modern humans) burial sites dating back as far as 33,000 B.C.E. 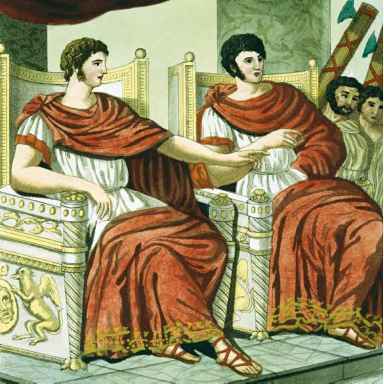 in the southwest of modern-day France also showed evidence of the use of red dyes on the body. 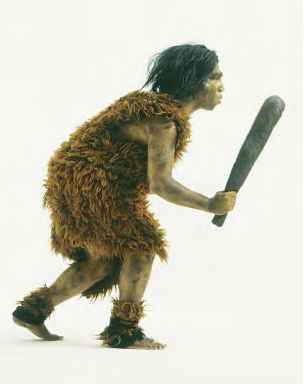 Cavemen wore fur to keep their bodies warm and protect their feet against rough terrain. Reproduced by permission of © James WW. Porter/CORBIS. women more appealing to potential mates. The use of decoration to draw attention to a woman's sexual qualities would become one of the primary functions of fashion throughout human history. Evidence of male body decoration is more elusive, but it seems very likely that early man also decorated his body. Given the examples of primitive peoples who survived into the modern era, including the Aborigines in Australia and Native Americans in North America, who use elaborate patterns of decoration for many occasions, scientists believe that it is likely that early man did so as well. The body was likely painted in order to provide camouflage while hunting or for ritual or social occasions. They may also have used other forms of decoration such as tattooing or scarification, in which small cuts are made in the skin to create permanent scars in patterns. In addition to body painting and decoration, it is also clear that beginning with Neanderthal man, early humans did enjoy wearing decorative objects. The gravesites of Neanderthals indicate that both men and women liked to ornament themselves with bracelets and necklaces that consisted of a length of animal hide strung with beads, shells, teeth, bones, or other small objects. Powell, Jillian. Traditions around the World: Body Decoration. New York: Thomson Learning, 1995.